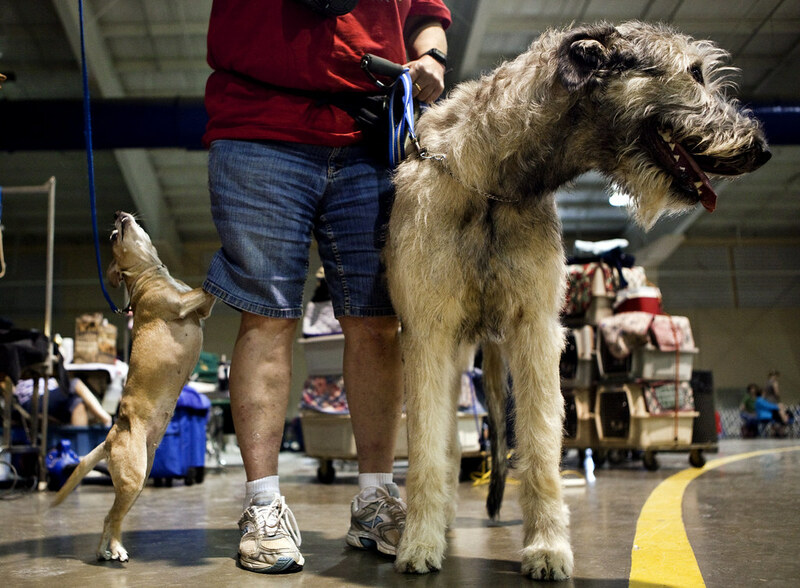 Sue Halperson gets ready to take her Chihuahua, Ginger, and her Irish Wolfhound, Ms. Georgia, for a walk at the American Kennel Club all-breed dog show at the arena in Southaven, MS. The grave of Gelert can be found just south of Snowdon, in the grey-stoned village of Beddgelert set among the wild mountains of Wales. Here, in a beautiful meadow below Cerrig Llan, is a large stone slab lying on its side with two upright slabs which owes its fame to the legend of Prince Llewelyn ap Iorwerth and his faithful hound. Llewelyn (1173-1240 CE) was very fond of hunting and in the summer he lived in a hunting lodge at the foot of Snowdon. Although he had many dogs, his favorite was the brave Gelert, his great Irish Wolf Hound, not only a dog fearless in the hunt, but a loyal friend and companion at the fireside. One fateful day on the hunt, Gelert refused to accompany his master further, but instead he ran howling back to the Lodge. When Llewellyn returned he was met by his dog, bounding to meet him, but splashed with blood around his muzzle. On entering his living quarters, Llewellyn found a scene of confusion with rooms disordered and articles scattered in heaps. Now Llewelyn had a son, barely a year old, and as the prince recalled how Gelert and his little boy used to play together, a terrible thought came to his mind! He rushed to the nursery only to find the cradle was overturned, the bed clothes bloody and though he looked frantically for his son, the child could not be found. Turning to Gelert, whose muzzle was still wet with blood, Llewelyn came into a great rage and cried, “Thou hast killed my only son”, and drew his sword and drove it into the heart of the hound. Then- as all was silent but for the steady drip of blood onto the stone flag floor, the wail of a baby could be heard. On searching further Llewellen found his son safe and well, lying next to the body of a large grey wolf. It was plain to Llewellen what had happened. Gelert had killed the wolf whilst defending the baby from attack. Overcome with grief at his hasty action, Llewellyn buried Gelert with all honor and raised a memorial over his grave. From then on the settlement was known as Beddgelert, meaning “Gelert’s Grave” and this is the traditional tale still told today. 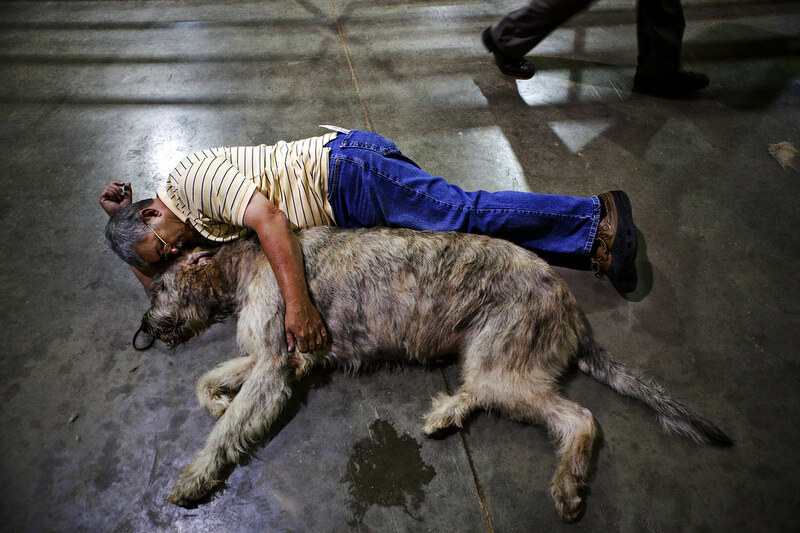 Larry Emory takes takes a nap with Brogan, a two-year old Irish wolfhound, on the floor of the Southaven arena after Brogan won best in his breed at the American Kennel Club all-breed dog show. Wow. What a moving story. I'm sharing this with my dog-loving friends.